The message of life is encoded in our genomic DNA through transcription of messenger RNAs and translation of proteins to perform cellular functions. To ensure accurate transcription—a process that transcribes genomic DNA into messenger RNA by adding nucleotides one by one like letters in the alphabet, an enzyme called RNA polymerase II synthesizes and proofreads messenger RNA to remove any mis-incorporated nucleotides that do not match with the DNA template. While RNA polymerase II was known to be critical in ensuring the accuracy of transcription, it had been a longstanding puzzle as to how this enzyme accomplishes this difficult task. Determining the underlying mechanisms could offer insights into errors made during this otherwise highly accurate transcription process, which may lead to various human diseases. A research team led by Prof. Huang Xuhui, Padma Harilela Associate Professor of Science in the Department of Chemistry and Department of Chemical and Biological Engineering at HKUST now reports the mechanism for RNA polymerase II to correct errors in RNA synthesis. When a nucleotide is added by mistake, RNA polymerase II can rewind by moving backwards (called backtracking) and cleave this mis-incorporated nucleotide. The research team found that while specific amino acid residues of RNA polymerase II are critical for backtracking, cleavage of the mis-incorporated nucleotide only requires the RNA itself (i.e. phosphate oxygen of mis-incorporated nucleotide). "RNA polymerase II is like a molecular machine in the cell. Nature cleverly designs this machine to catalyze two distinct chemical reactions in a single active site without getting mixed up. While normal RNA synthesis requires specific amino acid residues of RNA polymerase II, we found that the removal of the mismatched nucleotide does not rely on any amino acid residues. 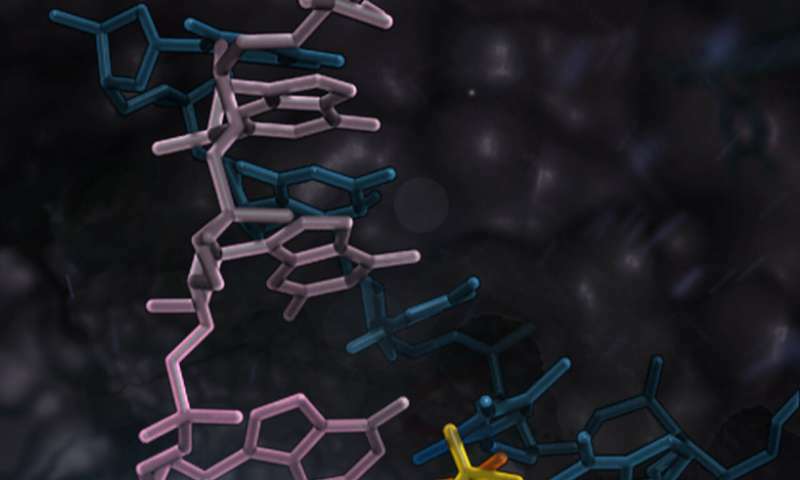 This molecular machine seamlessly coordinates these two functions in one active site," said Prof. Huang. "Our discovery offers valuable insights into how transcription may go wrong in aging and diseased cells, and to what extent transcriptional errors may lead to various human diseases." "Our work is only possible with the large-scale high-performance computing resources mostly provided by the Shaheen Supercomputer in collaboration with King Abdullah University of Science and Technology (KAUST)", Prof. Huang added. "Our quantum mechanics and molecular dynamics calculations consumed 20 million CPU core hours in total."